Honor is the one of the best smartphone company has recently launched its new Smartphone Honor 9 Lite in Indian Market.This Smartphone once again will be available for sale from 12 noon today.It is very difficult to get good camera smartphone in the budget. Mostly In this price segment, most of the smartphone companies try to give better processor, more RAM and more storage, so that they can grab customers attention in easy way.If you are also looking for stylish and attractive smartphone with good features, then this smartphone is the definately one of the best option for you. The Honor has introduced this Smartphone in Various color option like Safer Blue, Midnight Black and Glacier Gray Color. Honor 9 Lite is also equipped with some good features and specifications so let’s check it out one by one.Apart from this if you buy this Smartphone from Flipkart, then you will get a buyback guarantee of up to Rs. 7,000 which is one of the superb deal which everyone wanna check it out. Honor 9 lite has a 5.65 inch Full HD Plus display with a resolution of 1080 x 2160. 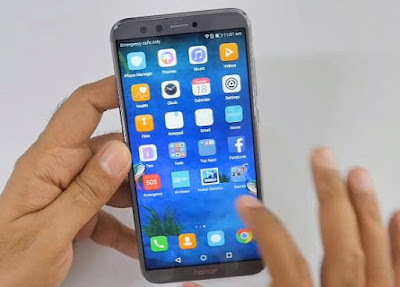 There are many smartphones currently in the market, which come with 1080 pixel resolution screens, but in terms of price segment Honor 9 Lite is clearly winner.The Honor 9 Lite is the only smartphone which comes with 18: 9 aspect ratio screen and dual lens camera in front and back side within budget price segment of Rs 15,000.Honor 9 Lite is phone comes with two dual rear camera in front and rear side of the Smartphone, which is 13MP + 2MP camera option. Apart from this, the Smartphone’s rear camera supports face detection autofocus. This phone has also supports camera features like portrait, wide aperture, moving pictures and beauty modes.The Smartphone has an octa-core HiSilicon Kirin 659 chipset.phone is available in 3 GB and 4GB RAM variants. This Honor 9 Lite is based on Android 8.0 Oreo Os. A battery back up of 3,000 mAh which is strong enough for all day to day activities. For better Network connectivity this SmartPhone comes with 4G VoLTE, Wi-Fi 802.11 b / g / n, Bluetooth, GPS / A-GPS, 3.5mm audio jack and OTG support with micro-USB.